Bolle Silium #40074 With Smoke Gray Anti-Fog And Anti-Scratch Lens. Brass, nickel free frame with a non-conductive coating for added safety. Spring-flex hinges for superior comfort and non-pressure fit. Close fitting, high contour design for improved eye protection with distortion free viewing and superior optical quality. 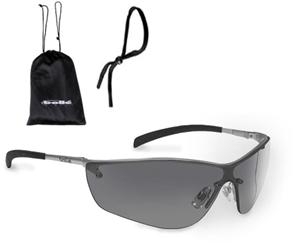 Nickel free metal non-conductive frame providing extensive eye coverage. High impact polycarbonate lens, anti-scratch and anti-fog coating on both lens sides. Optimal fit and comfort with non-slip temple tips. Rubber nose pads and reinforced nose bridge. Supplied with soft pouch bag and adjustable cord. Meets ANSI Z87.1.